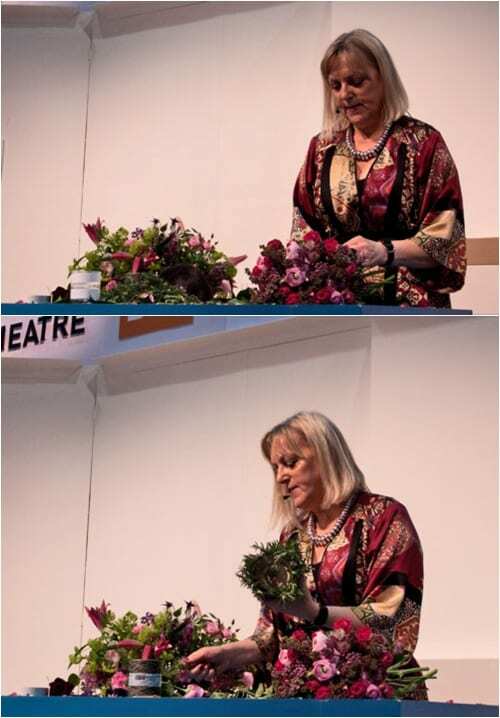 Last month, I attended a floristry demonstration by Paula Pryke at the Ideal Home Show in London. And today, I’m featuring some photos from the event plus details of the beautiful arrangements which Paula created. Her first design was the arrangement above. 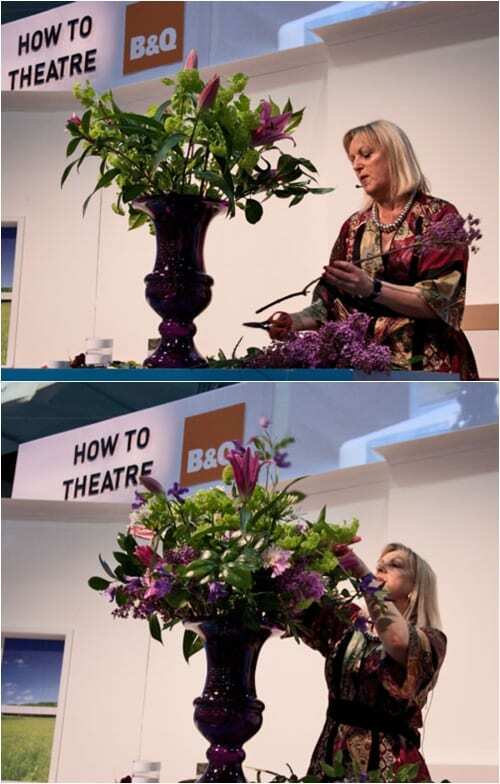 She started by placing cellophane in the bottom of the vase to lessen its depth. 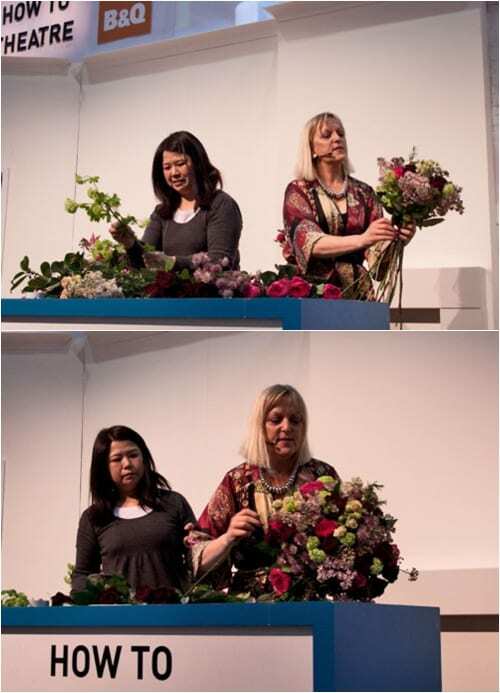 Then she used two types of foliage to give a natural feel…camellia and guelder rose. She said that it’s now recommended that you don’t cut up the centre of woody stems, such as guelder rose, as it can damage the cell structure. 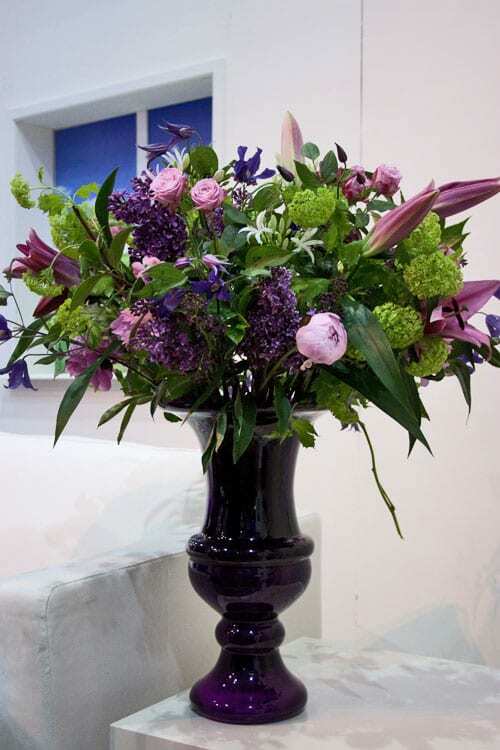 Next she added deep pink lilies and dark purple lilac, at differing heights, followed by peonies, roses and white agapanthus. Over the last three years, a new cut flower has become very popular in the floristry world due to its trailing nature and longevity…the clematis. Paula added some stems of a purple variety to finish off the arrangement. 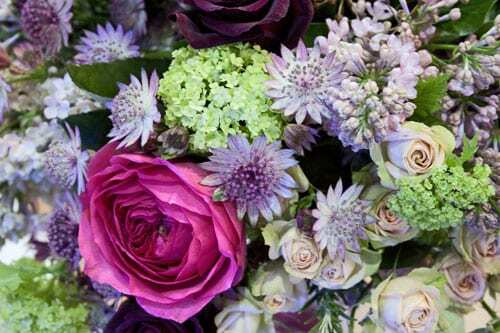 Her second design was a pretty posy of spray roses, astrantia, lilac, ranunculus and berried ivy. Paula placed the arrangement in a glass tumbler which she covered with rosemary, by using double-sided carpet tape and a raffia tie. 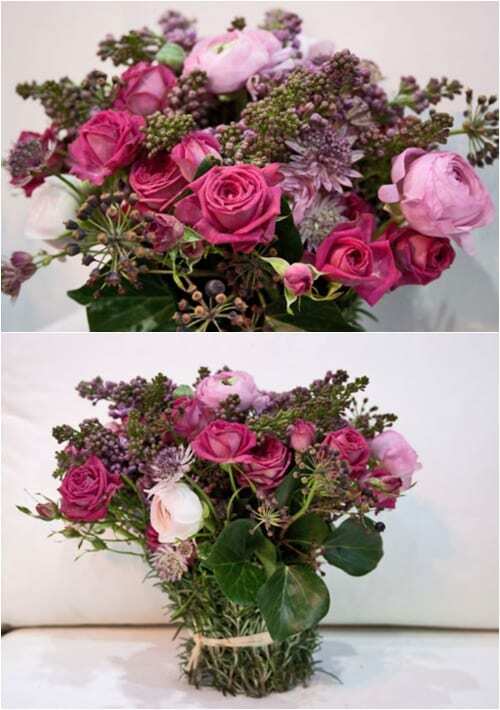 For the third design, she made a hand-tied bouquet of deep red Black Baccara roses, bright pink roses, astrantia, guelder rose, pale lilac, spray roses, rosemary and berried ivy. 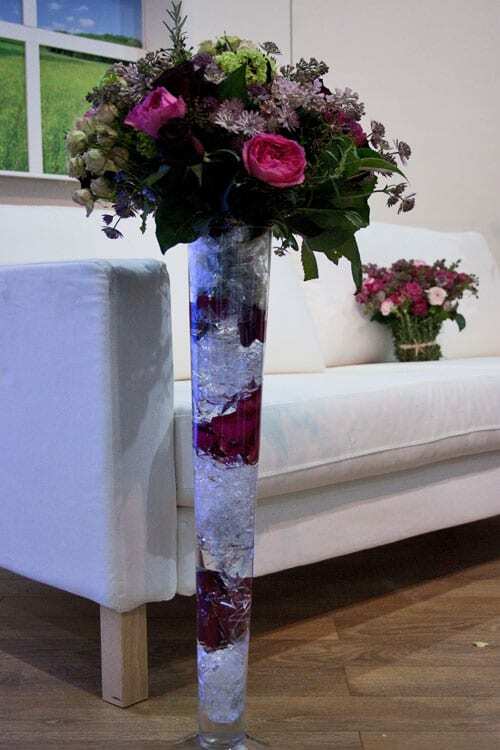 To make the design suitable for a wedding or celebration, Paula then placed it in a very tall vase. In the vase, florist Hisako who was helping Paula, had placed alternate layers of cellophane and rose petals, before filling it with water. The final design would be perfect as a tablecentre at a wedding. Paula started off with a metal candelabra on to which she’d wired blossom. At the base of the candelabra, she placed a soaked foam ring and insert three different types of foliage…senecio, camellia and berried ivy. 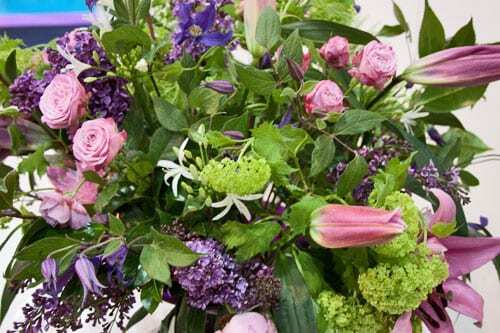 Then using a white and green colour theme, she added spirea, eryngium, stocks, lisianthus, veronica and Avalanche roses. I agree totally, I found the demo to be fantastic. 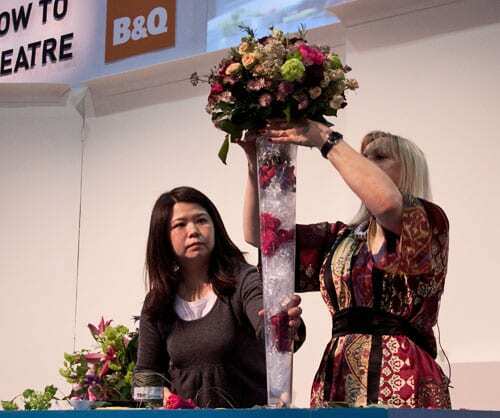 The range of arrangements and flowers were ideal and it was pitched so that the enthusiastic beginner could be inspired and those with a little more experience could ponder how they wanted to adapt a “Paula Design” for their own. 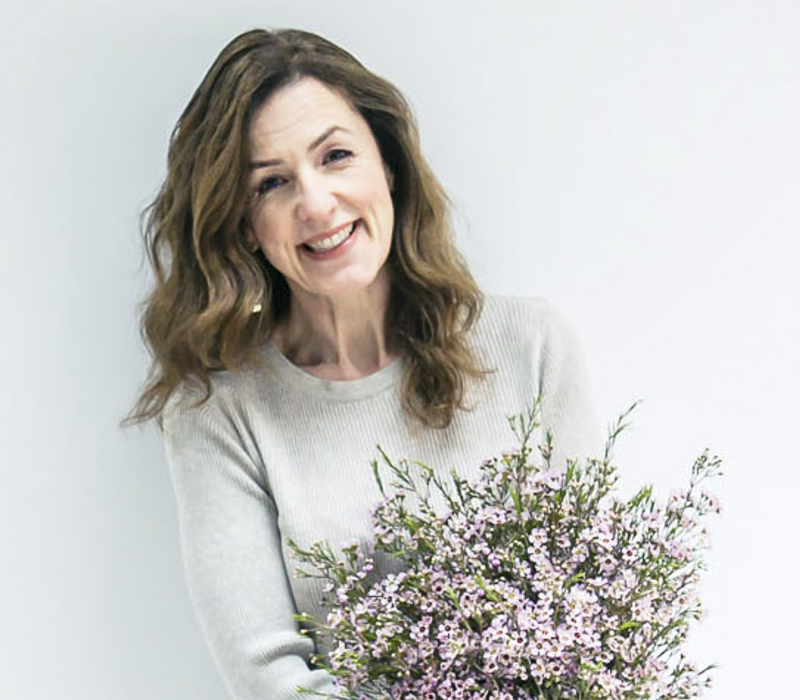 I’ve been inspired by Paula for a few years now, having started out by buying Simply Pink, mainly as ideas for mine and my friends wedding, and finding my first steps into the world of Floristry. I continue with every book, article and demo to be inspired. I can not imagine a point when I won’t be fascinated and excited by these inspirational creations. 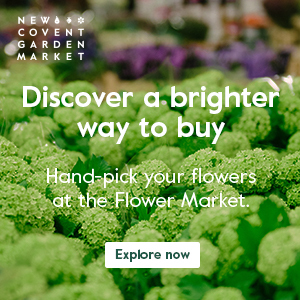 I look forward to many more years of being in awe of fun, exceptional and thought provoking arrangements and continuing my love affair with Floristry and Floral Design.